Bring environmental responsibility to a whole new level in your bathroom with a Baden Bath dual flush toilet, powered by the eco-friendly GreenWave flush system. Each toilet holds 1.6 gallons of water, which is the American standard capacity. The dual flush Green Wave European style flush system allows for either a full 1.6 gallon flush or a half (0.8 gallon) flush. The GreenWave system works with any plumbing system. Baden’s brand new line of dual flush toilets offer a sleek, contemporary round design that is perfect for modern bathroom décor. Baden Bath dual flush toilets are available in a variety of shapes and sizes and feature a one-piece design. All Baden toilets are outfitted with soft closing lids that do not bang when they are closed. You can outfit your bathroom in style while helping the environment by conserving water with each flush. Baden Bath is committed to creating luxurious products designed to transform the bathroom into a luxurious oasis. Baden ships products to customers all over the world from its distribution center located in Brentwood, TN. 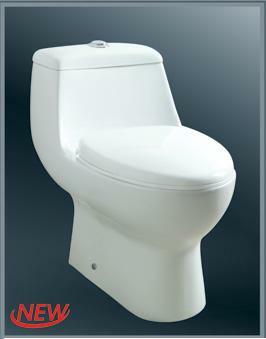 The retail price for Baden Bath’s Dual Flush toilets ranges from $160 - $475.